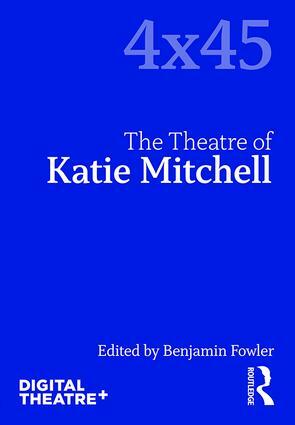 This first volume in the 4x45 series investigates the work of theatre director Katie Mitchell. Pausing to reconsider a career in progress, it engages with some of Mitchell’s most recent work in the UK and Europe across theatre, opera, and Live Cinema. It also takes a longer view, considering the early turns that Mitchell took at the start of her career in the late 1980s. This volume gives full scope to the voice of the practitioner, alongside scholarly perspectives, in order to understand the work from within. Interviews with Mitchell’s collaborators get inside her process – and inside the thinking of key artists who help craft the distinctive visual, aesthetic and technological forms of Mitchell’s productions. Three major concerns criss-cross these contributions: the political implications of aesthetic form; the meaning of Mitchell’s interest in the radical project of early Naturalism; and the influence of Europe on Mitchell’s avant-garde experimentalism, which often draws on technology to open up new modes of perception and experience. An accessible and encompassing examination of one of Europe's most celebrated theatrical talents, 4x45 | The Theatre of Katie Mitchell is a unique resource for scholars,students and practitioners of Theatre Studies, Performance and Directing. Benjamin Fowler is a Lecturer in Drama, Theatre and Performance at the University of Sussex who writes about directoral practice in contemporary European Theatre. Forthcoming publications include a monograph on the work of Katie Mitchell (Routledge, 2020).